Harvard Common Press, 9781558323629, 352pp. Vegetarian fare has never been so quick, diverse, or delicious. 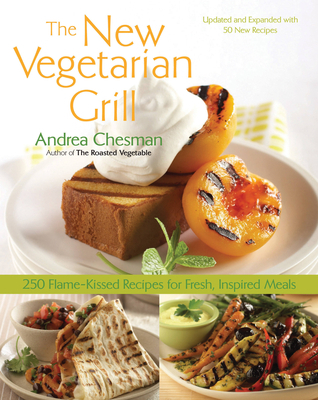 In this updated version of her best-selling classic, Andrea Chesman presents more than 250 recipes that demonstrate the scope and versatility of grilled vegetarian meals. Vegetables cooked on the grill take on a sweet and smoky taste that's irresistible, and these simple, sophisticated dishes will appeal to vegetarians, and meat-eaters alike. With recipes ranging from Brie, Cranberry, and Pistachio Quesadillas to Marinated Roasted Pepper and Olive Salad, from Grilled Eggplant Steak Sandwiches to Spinach-Feta Pizza, from Wok-Grilled Vegetable Lo Mein to Tandoori-Style Vegetable Kabobs, The New Vegetarian Grill amply demonstrates the wealth of vegetarian fare you can prepare on your gas or charcoal grill. In addition to updated recipes, this new edition features expanded information on grilling techniques and equipment options. Explore a world of wholesome, flavorful vegetarian cuisine - without leaving your own backyard.